KGO’s Maureen Langen is so much fun. Here’s an interview with her that will tell you more about Off The Beaten Page. Visiting Lubeck, Germany on a Thomas Mann-inspired tour. This is the second part of an interview with Susan Jessop who has shared with me the experiences of her fabulous book club in Ottawa, Canada. In my previous post, we covered some the group’s ideas for book-related travel close-to-home and some suggestions for Canadian authors you’ll want to add to your reading list, no matter where you live. 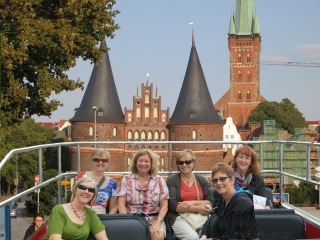 Next, we cover the group’s big trip: to Lubeck (a.k.a. Luebeck), Germany. Admittedly, they have a leg up because Susan has family there, hence, the inside scoop on accommodations and tours. I’ve never been to Lubeck, but from the pictures I’ve seen it’s old town area looks wildly charming. She has excellent tips to make a successful trip. Hopefully, their ideas will inspire you and your travel companions to venture out into the world with a few good books. So, Susan, tell us in a nutshell about your lit trip to Germany. I’m not sure who launched the idea initially but as I own a condo in the town of Lubeck, Germany and my brother has several tourist apartments, I thought that this was quite doable. I checked with family for dates and availability. Once we’d settled on a date, I agreed to put together a program and run it past our group (I was really hoping for full executive control knowing that I’d wear this if we took a haphazard approach!). We had a planning meeting with the six ladies who finally committed to going. I settled on the book Buddenbrooks: A Family in Decline written by Thomas Mann in 1918 at the age of 23. The selection was a no-brainer as there is nary a German alive who doesn’t know of and admire this book. Thomas Mann won the Nobel Prize for Literature in 1923 mainly for this novel. Lubeck is the setting for the book and many landmarks are still there today. In fact, a few years earlier a German production was filmed on location and my sister-in-law and nephew were film extras. It was a natural choice, but at over 700 pages and written almost 100 years ago I was worried the ladies would kill me if they didn’t like it! Our itinerary included a hop on/hop off tour, which had the worst English translations imaginable, of the city highlights. We were in stitches as we travelled through town. Fortunately, the tour I arranged at Buddenbrook Haus [if you can read German, check out their Web site, http://buddenbrookhaus.de%5D was led by a highly competent tour guide who captivated us for two hours on Mann family lore. We also arranged for a viewing of the movie (the very one featuring my nephew walking down the street from behind!). My brother has a wonderful retro home theatre complete with red velvet movie seats for 20. He served us champagne and home made popcorn! We also took an afternoon boat trip up the Trave River to the Baltic Sea where the Buddenbrooks holidayed, and a day trip to Hamburg where one of the characters lived. In between, I made sure there was lots of down time for shopping and entertainment (notably wine and good food). I think we had a really good time. The book was also a great read and really came alive as we walked the streets of this lovely medieval town. Did the trip bring your group closer together? How so? I think the trip did bring us closer together. It’s an interesting group. Some women are close friends but mostly I would describe us as acquaintances that really enjoy each others’ company in the context of books. We all know the old adage that traveling is the surest way to get to know someone, for better or worse! We did indeed get to know each other better. There was a cranky moment or two, but when you have that many independent, take charge women together, it’s bound to happen! Did it give you a greater understanding of the book(s) you read relating to the trip and the culture where you traveled? Please explain. Absolutely! My imagination has been fueled by reading all my life, but as an English major in university, the feelings I had when I finally walked through the locations from my favourite novels were special. Any tips or suggestions for people who are organizing book-related travel? I think I implied in one of the previous answers that planning is really important! You want to make sure that you have your activities lined up and not left to chance. If you’re the organizer, ask your book club members for permission to take charge and give them a bit of a preview before the trip to confirm that you’re not out in left field. Our trip was about 6-7 days but I still made sure there were a couple of down days. For sure the first day has to be relaxed to allow for some recovery from jet lag if that’s a factor and leave time for shopping during the trip. Do try this! Book club outings enrich the experience! You could reasonably begin with a local outing and move up to a weekend and finally an international trip. We are starting to talk and plan our next trip to Bath, England …. Jane Austen territory!!!! Woo Hoo. One of our members has a sister in Bath and she is doing some reconnaissance for us. One activity we’ve discussed is bringing her sister’s book group together for a meeting with ours while we are there. Now that will be interesting!